with Ines Zeller Bass and Jana Zeller! 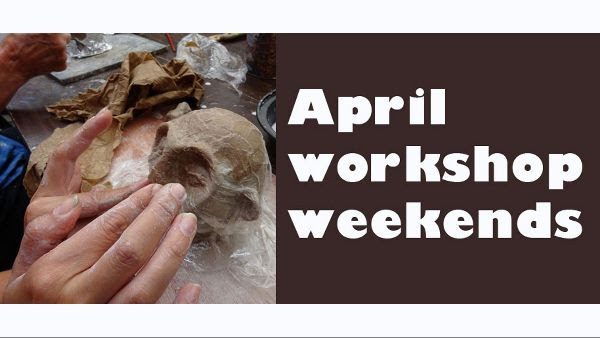 April Weekend Workshops are a great way to engage with one aspect of puppetry for a concentrated weekend. Workshops include the art of puppet building, performing with puppets and using puppets as a tool for teaching. For ages 18+. Under the masterful guidance of Sandglass co-founder Ines Zeller Bass and Sandglass company member Jana Zeller, participants will learn the basics of a customized rod puppet. The process will include modeling a head and hand, techniques for painting puppet faces, and a fabric body. From this foundational structure students will develop and discover their own unique puppet characters. Sandglass’ Artistic Directors, Eric Bass and Shoshana Bass, will lead participants through a number of exercises and concepts for breathing life into a puppet. Through breath and the power of the imagination, students will develop skills for working with one-person and three-person puppets, as well as developing short performance pieces. Sandglass Theater offers two weeks of full immersion into the art and soul of puppet theater. The intensive is offered to anyone who is seeking to expand and deepen their skill and understanding of the puppet. Led by Sandglass Theater’s artistic directors, Eric Bass and Ines Zeller Bass who have developed this training method for over 30 years. With co-teachers Jana Zeller and Shoshana Bass. For more information and to download an application go to sandglasstheater.org.